For the last few weeks Toyota has been running a few ads via the Reddit Advertising system. The four ads they have been running share a few things in common; they all use a question as part of their ad title and they all include an embedded YouTube video of a recent Toyota Rav4 Hybrid commercial. Toyota’s team also engaged with users in the comments of each ad and doled out Reddit Gold as a reward for top comments, the title of 2 of the ads included a mention of the Reddit Gold giveaway. This technique appears to be pretty unique as far as Reddit Ads go and earned Toyota thousands of comments across the 4 ads. We clearly don’t now how efficient or effective of a campaign this was in terms of ROI for Toyota, but it shows a nice blueprint for other brands and businesses trying to drum up engagement on the Reddit website via the ads system. To try and detect how well a Reddit post or ad performs we use a metric we call Engagement Points. 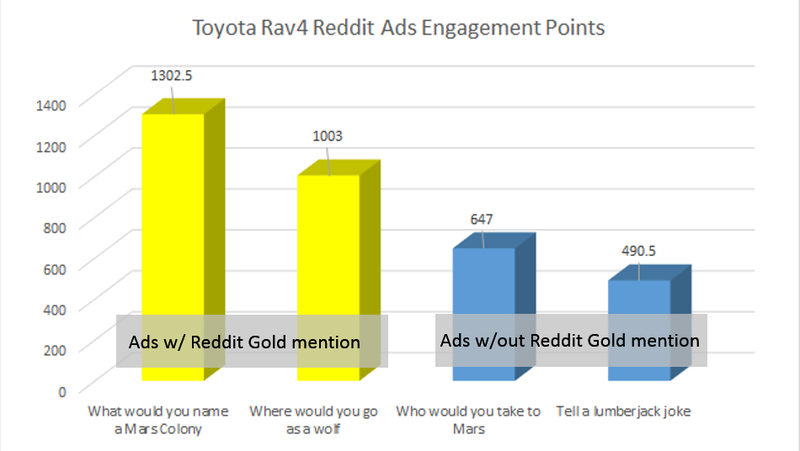 When we calculated the Engagement Points for the 4 Toyota ads we quickly discovered that ads that included the mention of Reddit Gold performed better with the improvement being between 100% and 165%. This is the first large scale advertising campaign we’ve seen on Reddit by a major brand. We’ve reached out to Toyota to see if they’ll share more details about the campaign and will let you know if there are any updates. Interesting study and good information. I wonder how you would A/B test a reddit ad.